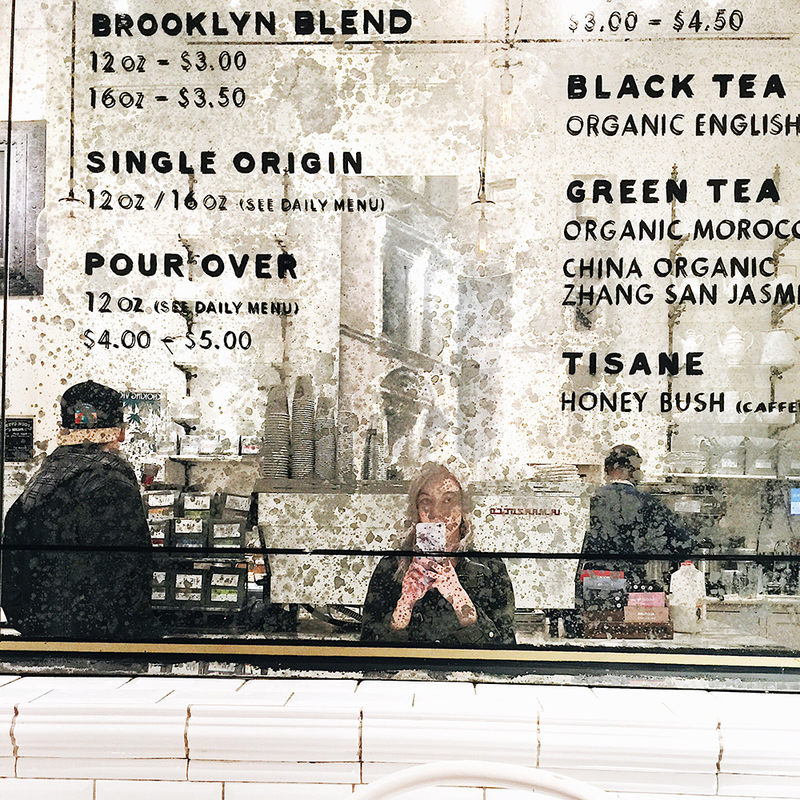 So you want to know about cafes in New York City? Well, I can be of some assistance and knowledge in this category. As mentioned in my first NYC blog post, I went to New York with the intention to visit a lot of cafes and restaurants. 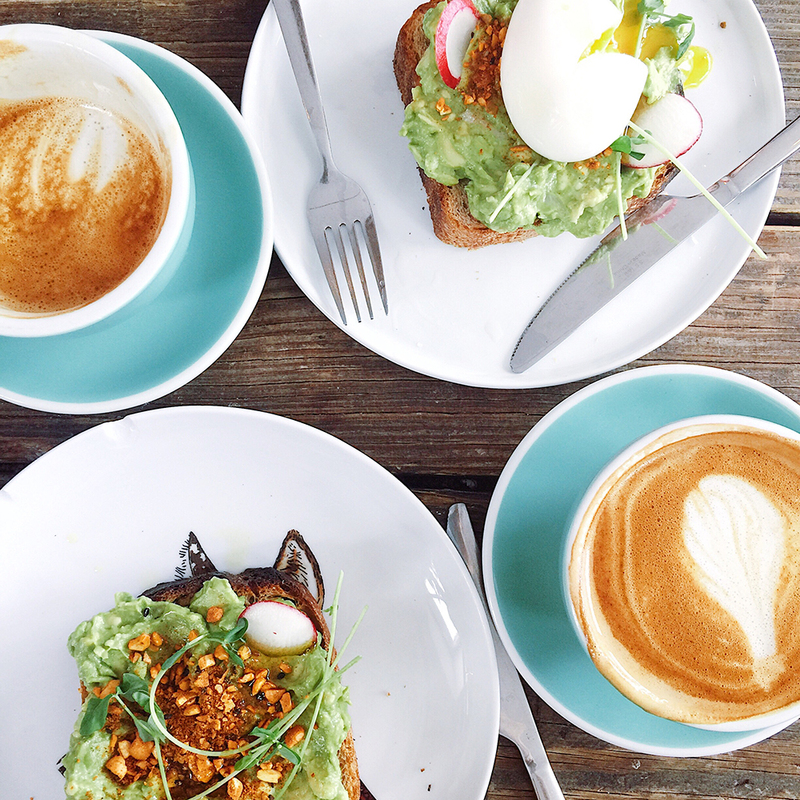 Part two of my New York Guide is going to focus mainly on the cafes. Some of the cafes and other food places may cross over a bit, but I am attempting to stick more to the cafe side of each place we visited. Our first cafe stop was the evening we arrived in the city and had just finished dinner. I’m not prone to visiting cafes late in the evening, but if I was planning to visit many cafes, I had to hit the ground running when I had the chance. We were staying very close to the Toby’s Estate Coffee on 5th Avenue between W 20th and 21st Street. I knew it was too late for coffee, so I opted for a green mint tea, while Matt got a mocha. We quickly explored the attached shops in the back, featuring a book shop, floral arrangements, and odds and ends. The interior of this cafe was very clean, apothecary-like if you will. An interior design that boggles my mind too much to describe. It resembles the style of Cafe Augusta (RIP – it will be missed) in Hamilton. A good way to start the cafe crawl over a few days. 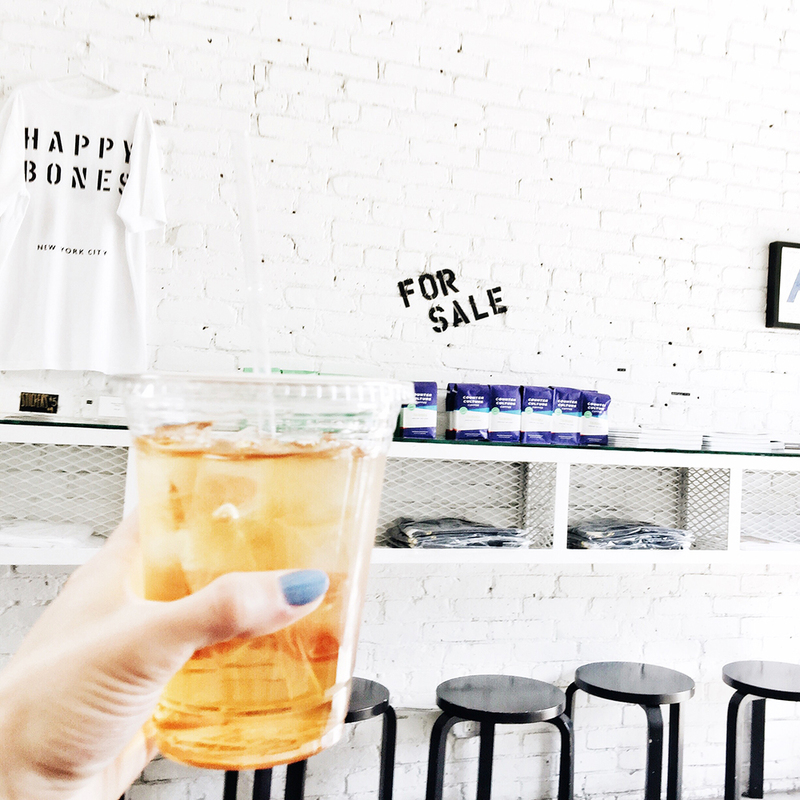 One of the cafes I have seen so much about through Instagram posts is Happy Bones. This is quite a small cafe located on Broome Street, but a “must visit” on my list. We experienced quite a bit of sunshine when we were in this neighbourhood, and stopped by Happy Bones for some iced teas to hydrate and cool down a bit. A display of doughnuts was tempting me, but we just stuck with the iced lattes and sat to rest our feet after a lot of walking. While walking through Chinatown, I was determined to make a stop into Sweet Moment. I had seen photos of the most creative latte art they have named “creamarts”. With their own mixture of cold brew and cream-based creation to create these cute bear faces on the top of a brown (mocha), green (matcha), or pink (red velvet) creamarts. Unfortunately, I could not partake in the pleasure of sipping away at the artsy drink due to its creamy contents, so I opted for just a coconut milk mocha. Matt got the red velvet creamart so I could at least see it in person and he stated that it actually tasted better than he was expecting. 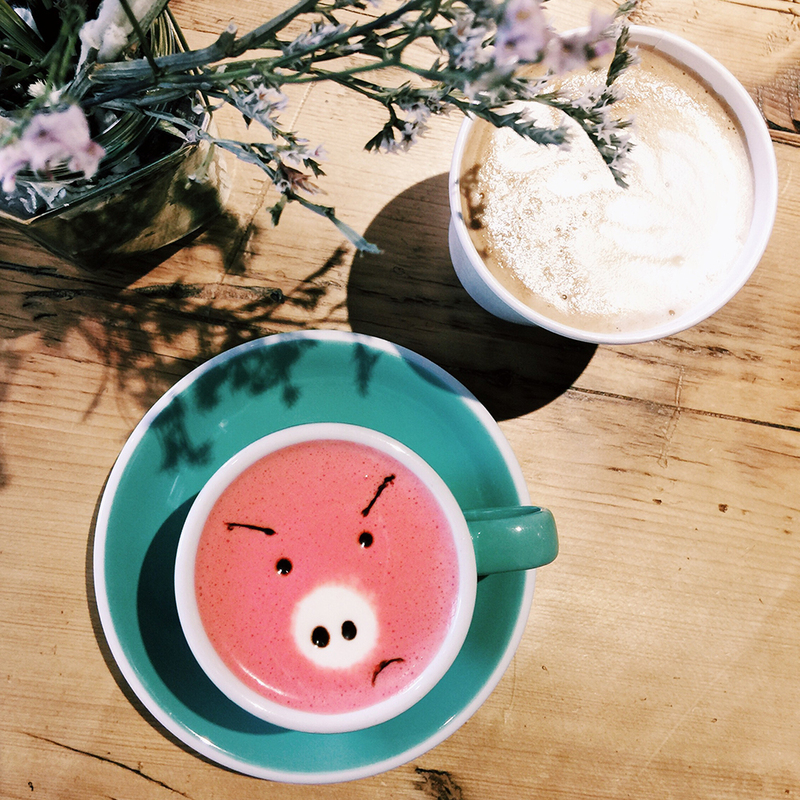 A must see if you are a fan of latte art and want some cute and colourful versions of it. The one cafe that we went to and I never took a photo as evidence. However, I did purchase a tank top, leaving me with the biggest piece of proof of visit possible. I had an iced chai latte from Birch Coffee and it was one of the greatest iced soy chai lattes that I have ever tasted. The spice to milk ratio was perfect. I would highly recommend checking out this coffee shop if you ever get the chance. Crossing over to Brooklyn for a few hours gave us the chance to check out a couple cafes. Our first stop was Stonefruit Espresso + Kitchen. Most of the cafes I had on my list were due to interior shots that I found on Instagram. This cafe had a cute corner set-up that I loved and that’s why it made the list. We were also on the hunt for food, so this would satisfy us with caffeine and a lunch because it was noon by the time we got there. As far as the coffee goes, we got vanilla lavender lattes. Not a menu item you see every day. I made the mistake of picking almond milk, re-affirming that I dislike almond milk. Matt did confirm that the latte was good though. Look forward to the next post to learn more about the food here. Last, but certainly not least, The End Brooklyn. After the world went crazy over Starbucks and their Unicorn Frap, I was ready to taste the opposite. 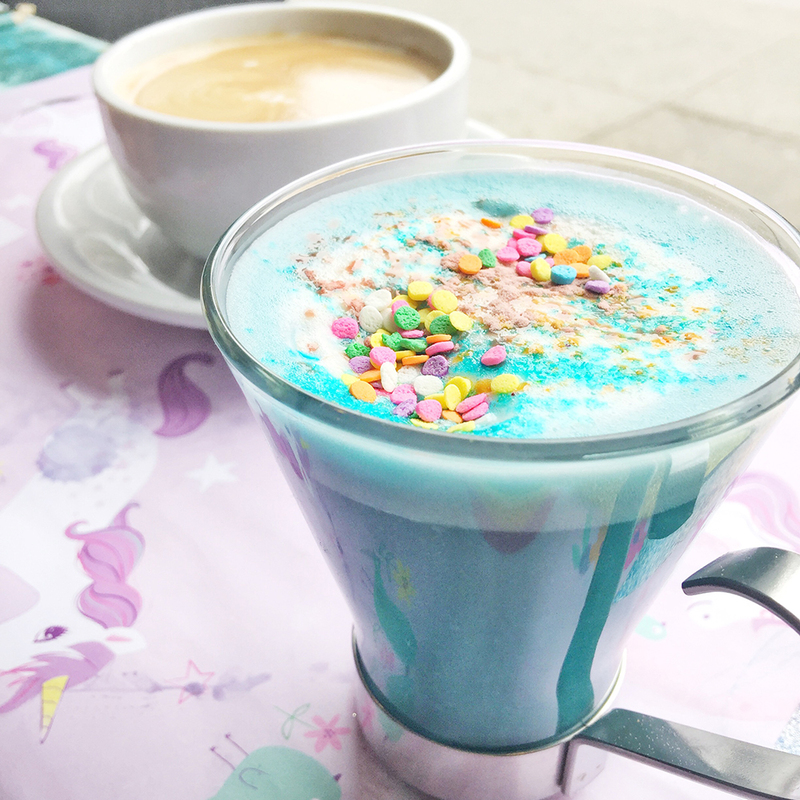 The Unicorn Latte from this unique little cafe was the complete opposite of the crazy sugar content of the frappuccino. This Williamsburg creation contains cold-pressed ginger, lemon juice, dates, and cashews… and additional healthy ingredients (such as maca root, blue-green algae, and vanilla bean). Very healthy. It doesn’t contain any coffee, but it is to be considered a warm juice elixir instead, but served like a latte. The bright blue colour and editable sprinkles were also fantastic touches.